Recently, I’ve lost close to 25 pounds (don’t worry, I meant to, I’m not sick or anything). That means a lot of my clothes, especially my pants are starting to feel too big. I don’t want to buy too many new things, because I have another 15 – 20 pounds to go. 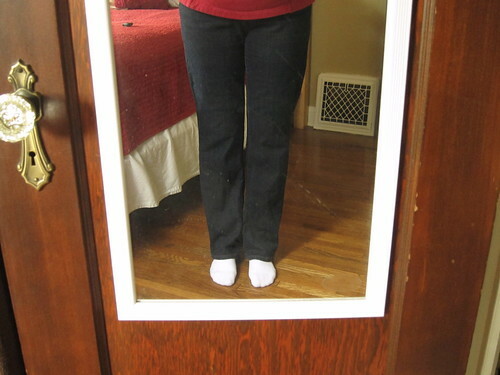 I dug out a pair of jeans that used to be too tight and they fit just right. The only problem was the cut of the legs. They say they are bootcut, but I feel like they are bootcut verging on bell bottom. (and they need a visit with an iron.) I find myself preferring a straight leg jeans these days, not a skinny fit, but just a straight, slim fit. So, I decided to alter these jeans to the cut I wanted. This is an easy fix and something I’ve done many times over the years. It’s just too expensive to let good clothes go to waste. Here is the finished product. 1. Look at the side seams of your jeans. One side will have contrasting stitching and the other won’t. 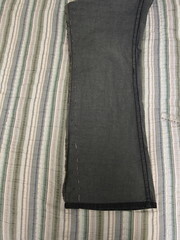 You are going to take your jeans in on the side without the contrasting stitching. 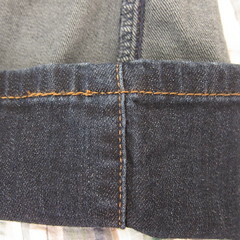 Turn the jeans inside out and lay them flat with the seam you are taking in as one edge. 2. For a straight leg you basically want the leg to be the same width down from the knee. 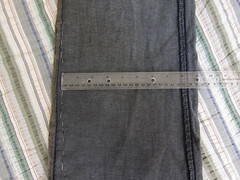 So, measure the width at the knee and then mark that width all the way down to the hem. Pin the seam. 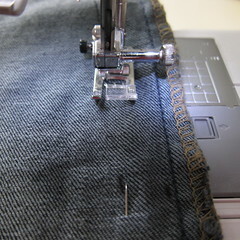 It is important to have the new seam work gradually into the old seam. If you make an abrupt arc into the old seam, you’ll have a pucker and that seam won’t hang right. 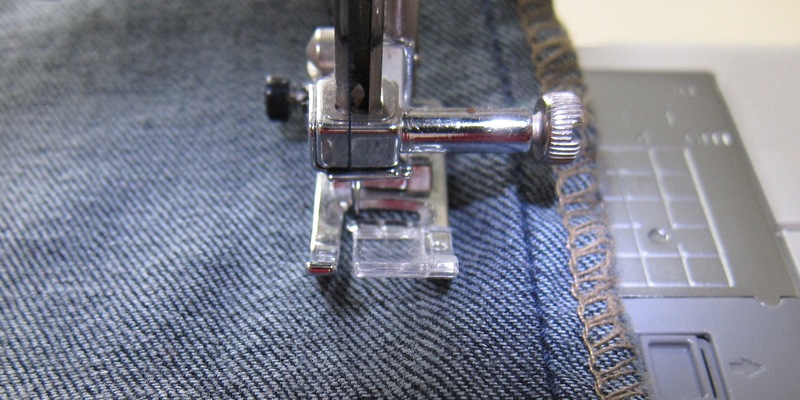 Pin one leg, turn it right side out and carefully try your jeans on. Do you like the way the pinned leg looks? If so, pin the second leg using the same measurements. With my jeans I found I wanted them taken in a litte more and wanted to start a little higher up to take the lower thigh and knee in too. You can, of course, turn your jeans into skinny jeans by taking them in even more. 3. Sew the seam you have marked. Make sure the cuff at the bottom is even. 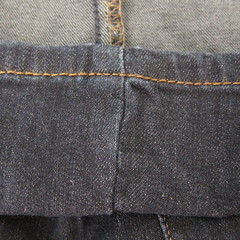 Reinforce the stitching at the cuff. 4. Trim the excess seam allowance to about 1/2″. 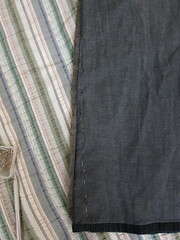 You can zig-zag stitch the raw seam allowance if you are worried about fraying. I’ve never had a problem with it. 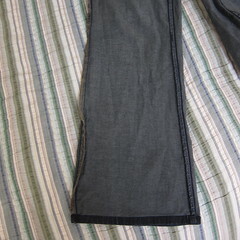 Voila, a pair of jeans sitting in my drawer are back into rotation. That is dollars in the bank. 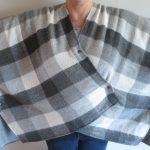 6 years ago by Kat in Needlecraft , Projects , Sewing , Sewing Projects | You can follow any responses to this entry through the RSS feed. You can leave a response, or trackback from your own site. Es una excelente idea, gracias por el tutorial. Thank you, thank you, THANK YOU! I can barely sew, and my jeans turned out perfectly. I was scared because they were expensive. You cannot see where the seams blend. You are a genius. Oh, I am so glad! Thanks for letting me know. As a male college student, I’m guessing I’m not the target audience of this 🙂 I had no sewing machine in hand, and didn’t really want to pay a tailor. 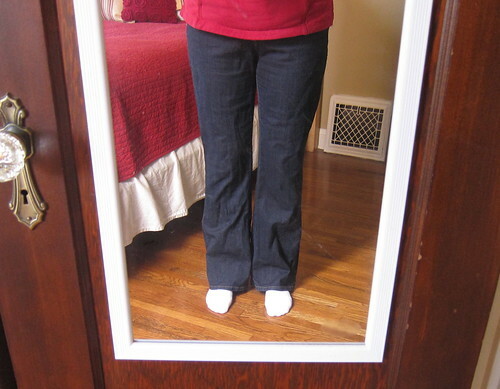 Following this guide and a fair bit of patience, I was able to hand-sew my pair of bootcut jeans into a nice straight one. Appreciated. Check to see if your local craft/fabric store has studio time available. You can use a sewing machine by the hour and they usually have friendly staff that can help you out if you have questions or are stuck. Good idea! I know there is a craft shop here in Mpls where you can get machine time. Thanks for the info. It looked that easy to me, but I wanted to be sure there weren’t any hidden nasties I didn’t anticipate. Tonight, I’m going to rework 2 pair of jeans that would cost over $100 each to replace. THANKS!! !